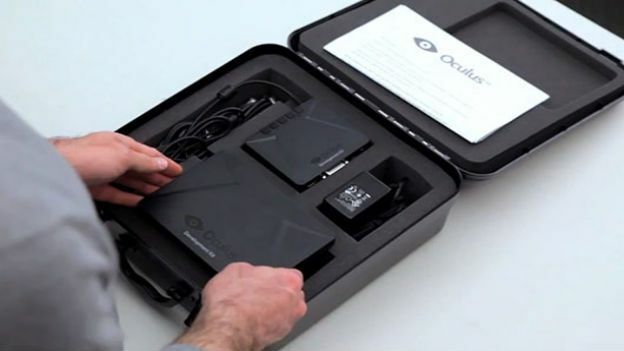 The Oculus Rift virtual reality headset began its campaign on Kickstarter last August, hitting its target of $250,000 in just four hours and the company have posted on their official blog that kits will start arriving to customers soon. Oculus confirmed back in November that they wouldn't be shipping until March and they have lived up to their statement. Following the announcement, Oculus have opened up the 'Oculus Developer Center' that will help everyone receiving the Rift development kit which includes the Oculus SDK, Unity and Unreal Engine integrations, samples, documentation, videos, the developer wiki, and community forums. The official blog post states, "It'll take time for us to ship 10,000+ development kits. Hold fast - they're coming." Initially promoted as a 5.6-inch LCD display, the VR headset was then replaced by the 1280x800 7-inch with a 30g increased in weight and wider overall device. Upon receiving the Rift, users have been recommended to download the Oculus SDK from the Development Center, and try the World Demo, a simple Tuscany-esque envrionment that was previously showcased at SXSW. To watch Oculus full SXSW panel, "Virtual Reality: The Holy Grail of Gaming' click here.